It was December 7, 1941, the day Pearl Harbor was attacked, bringing the United States into World War II. That evening, eager for news, millions of Americans turned on their radios to listen to...First Lady Eleanor Roosevelt. While her husband, President Franklin D. Roosevelt, would make his own famous radio address the next day, dubbing December 7 a "day that will live in infamy," it was his wife who first addressed the nation as part of a regular broadcast she made. Typically, she'd summarize the day's news and then address a subject of significance and interest to her, from whether a woman should be president to the problems of working women. In the meantime we, the people, are already prepared for action. For months now, the knowledge that something of this kind might happen has been hanging over our heads. And yet it seemed impossible to believe, impossible to drop the everyday things of life and feel that there was only one thing which was important: preparation to meet an enemy, no matter where he struck. That is all over now and there is no more uncertainty. We know what we have to face and we know that we are ready to face it. I should like to say just a word to the women in the country tonight. I have a boy at sea on a destroyer. For all I know he may be on his way to the Pacific. Two of my children are in coast cities on the Pacific. Many of you all over this country have boys in the services who will now be called upon to go into action. You have friends and families in what has suddenly become a danger zone. You cannot escape anxiety. You cannot escape a clutch of fear at your heart. And yet I hope that the certainty of what we have to meet will make you rise above these fears. We must go about our daily business more determined than ever to do the ordinary things as well as we can. And when we find a way to do anything more in our communities to help others to build morale, to give a feeling of security, we must do it. Whatever is asked of us, I am sure we can accomplish it. We are the free and unconquerable people of the United States of America. On the night Roosevelt gave this address, the vast majority of American homes had radios and listenership was high that anxious evening, as the people waited for more news. What can you learn from this famous speech? Let the echoes of freedom ring: I doubt that Roosevelt's use of "we, the people"--the familiar first words of the preamble to the U.S. constitution--was anything but intentional. It's a subtle reminder and call to action, underscoring her contention that democracy will prevail. 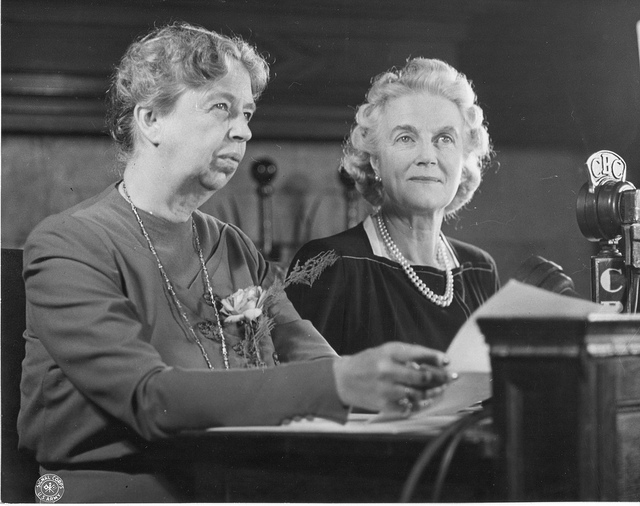 Set the tone: Americans might have expected to hear from the President on such an important matter, and here, Eleanor Roosevelt helped set the tone for her husband's remarks the next day. She encouraged listeners to focus on working to defeat the enemy and "do the ordinary things as well as we can," even if not going to fight. Reminding them that they were "free and unconquerable" also helped build a confident setting for the next day's remarks. Say what people are thinking and feeling: Your audience won't always vocally share its thoughts and feelings, but one of the speaker's great privileges and opportunities is the chance to give voice to those silent witnesses. Expressing what people are thinking and feeling--particularly in a stressful or challenging time--does an important service for the audience, lending perspective and building community. Use opposites to suggest forward progress: Eleanor Roosevelt used certainty and uncertainty and played them off each other in these brief remarks. Her words reflected the nation's anxieties as the war progressed before U.S. involvement, and even made those feelings an acceptable certainty: "You cannot escape anxiety. You cannot escape a clutch of fear at your heart. And yet I hope that the certainty of what we have to meet will make you rise above these fears." What a call to action, and one to which any listener could relate. 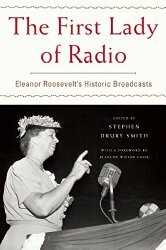 You can find a complete transcript of this radio address in The First Lady of Radio: Eleanor Roosevelt's Historic Broadcasts , and if you purchase the Kindle edition, you can hear it in the audio extras...a great opportunity to hear this outstanding speaker. You'll learn a lot about her controversial advertiser-sponsored broadcasts, how she worked on her own addresses, and the vocal coaching she got to lower her very highly pitched voice a bit. Explore this companion American Radio Works documentary about both Roosevelts' historic radio broadcasts to hear more. I've got two small-group workshops coming up on Creating a TED-quality talk in Washington, DC, in January. Choose the January 14 workshop or the January 28 workshop. All you need to do is bring your one big idea for a talk in the style of TED. You'll learn how to plan, write, time, practice, and deliver it in a group limited to 5 people per workshop. Join us! You get the best discount if you register by October 30, 2015.